Add a structured element to your formal and work attire with pencil skirts online. 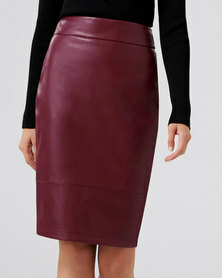 Pencil skirts are figure-hugging and are great at streamlining your look. Zando’s assortment of women’s pencil skirts feature amazing hues like universally flattering black, shades of grey, naturals, blue, as well as fun prints, sequined skirts, floral and a whole lot more to choose from. Match pencil skirts with a pair of ankle strap sandals and a blouse for a work-appropriate attire and for a night out, style with a tank top, biker jacket and ankle boots. Get a staple black pencil skirt for work or a graphic pencil for a fun take on a conservative piece of clothing. Peruse Zando’s wide selection of skirts for women and awaken your feminine side!